Next time you send me a complimentary, personalized photo of the Johnsey twins, please remember to include the supplemental dartboard. I wonder if I can get in on some of the action. Where did these guys learn how to write? “America today has used all its force, as well as the help of others, to fight Islam under the so-called war on terror, which is nothing but a vicious crusade against Muslims,” the statement said. Ann Althouse doesn’t care for the Rubes in Paradise theme I touched on I mentioned last night–except she’s talking about the extra condescending, non-Republican sponsored asides provided by media commentators. McCain rocks. My wife is done with her Dance Dance Revolution on the den television for the night. I am watching Giuliani on cable. T1 passes in a pinch, but it’s not cable television yet. 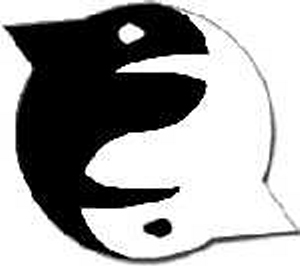 The mission was necessary, achieveable, and noble. Boo to you, Michael Moore. I would like to point out that I personally supported McCain before Bush in 2000. I think he’s crazy enough to carried the war to the terrorists in 2001 and beyond. Also, McCain as president, there would have been no McCain-Feingold. There, I said it. John McCain, who cannot comb his own hair from hanging and torture in POW camps in North Vietnam, says this is the challenge of our generation. His, and ours. It’s the continuing challenge of all American generations. Lindsey Graham? I never would have guessed from his vocals on “Big Love” that he had a southern accent. United America? I daresay not. We are the United States of America, you politico. We shall not dissolve the electoral college, nor will we let the majority of Americans rule this country. I thought they said you were from North Carolina. Sounds like a Washingtonian sentiment to me. Spare me the Rubes in Paradise interviews with people from the rest of the country who’re in NYC for the first time. I’ve never been to NYC, and I’m no worse for wear. No less sophisticated, no less educated, and Hillary Clinton is not one of my senators. Sometimes a Cocoon allusion just feels right. This is opening night of the festival? Kerik, police officers, fire department union members in Milwaukee, Zainab Al-Suwaij, and then the crescendo of McCain and Giuliani? Who said the GOP had no star power? If this is foreplay, I am a dead man! Sitting in the den with a laptop as you curse your wireless connection? Pah! You’re a piker. Me, I’m sitting in my office. I’ve deployed the T1 for its ultimate purpose: streaming media. I’ve got the eMac fired up and running the CSPAN live feed while I sit here and blog on my primary Windows machine. Face it. You are a poor geek. Bow to me! That giant blue elephant on the video screen behind the podium would be a whole lot better in 3D, ainna? Whoa! Look out for that trunk! The corporate world proves B.F Skinner right once again. Our local Pizza Hut charges seventy-five cents for deliveries now, a cost it just appends to the top of your coupon and the tax. It doesn’t break out the cost nor publicize it anywhere, but you’re probably paying it. Thanks to the phone companies, wireless companies, and all other companies who have accustomed consumers to surcharges, bogus taxes, and costs of businesses so that the advertised price represents purely the profit, and everything else is extra. Another Monday, another 5 unsolicited credit card offers, including 3 separate campaigns from Citibank. Gentlemen, it is my distinct pleasure to return your business reply envelopes with the terms of your offer, but not application. I consider it my small part to keep first class postal rates down and to raise your cost per customer acquisition for these campaigns. A plea for money from George Bush. Look, George, I’ve given money, we’re probably going to give up time and lawnspace for the campaign, but if you want more cash, you’re going to have to send a picture of your daughters. For this gambit to be effective, make sure that’s addressed to Mr. Brian and not Mrs. Heather (or, as she might be again known shortly after reading this post, Miss HLI, in which case I won’t have any money to give anyway). An offer for AOL 9.0 Optimized, which proclaims right on the box, Block Spam and Web Pop-Ups. As someone who’s logged into AOL 9.0 on a dial-up recently, I certainly notice the oversight that new customers won’t: Web Pop-Ups doesn’t say a damn thing about the six or ten AOL offers that display whenever you try to log in or log out. Those? Still in there. An overly expensive dial-up ISP that delivers its own ads to enhance my (slow) browsing experience? Throwing this out unopened is too good for this small box. A man, diagnosed with HIV in 1996, discovers it was an error. Relieved? Happy? Thrilled with his reprieve? What are you thinking? His rent was paid in part by a county health program. Project Open Hand delivered free meals. A nurse visited him at home every two weeks. His misdiagnosis is rare but undisputed and shows the far-reaching damage wrought by medical mistakes and the potential for flaws in burdened health care systems. Officials at the Oakland Department of Veterans Affairs’ outpatient clinic where he was treated admit the mistake and have launched an investigation into what went wrong and how the error was perpetuated year after year. VA officials were taken by surprise by the Aug. 4 letter in which the doctor accepted blame and admitted the error. Malone’s physician, Dr. Richard Karp, was not available to comment as the case is under investigation. Karen Pridmore, a spokeswoman for VA’s Northern California Health Care System, which has eight clinics and a medical center and serves more than 65, 000 patients, said Malone had arrived at the clinic in 1996 with lab results from an outside testing firm in Southern California. Those results showed he was HIV positive. The VA did its own confirmatory HIV test on Malone and found he was negative. Will this albeit anecdotal evidence silence calls for socialized medicine, which I don’t doubt the San Francisco Chronicle supports? Of course not. Undoubtedly, they would have the rest of the government do it better, by….Well….Erm…. A family member bought this card for the punchline, but didn’t realize that she wasn’t part of the niche market this card serves. 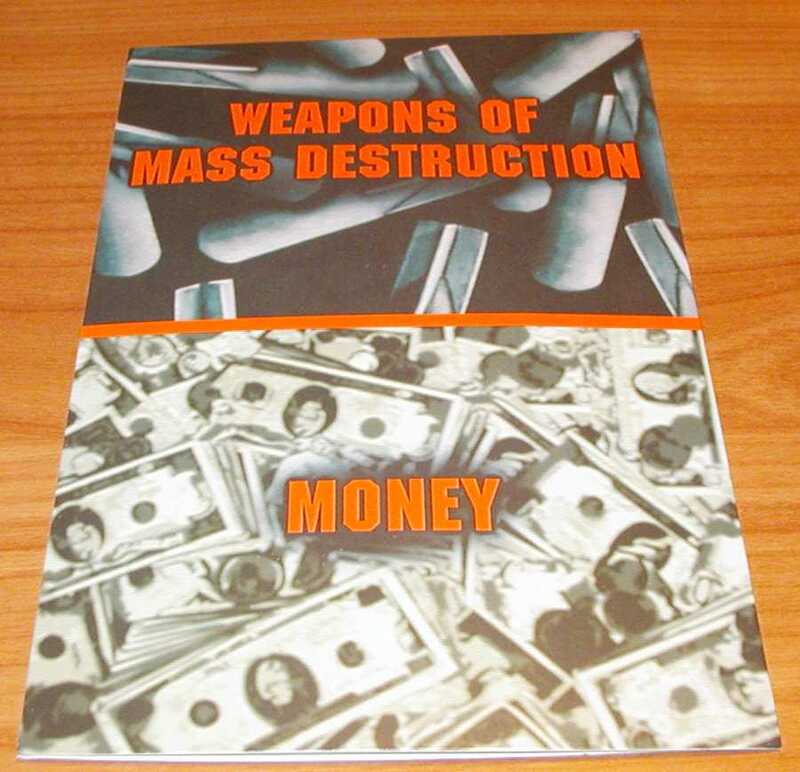 Weapons of Mass Destruction. Money. 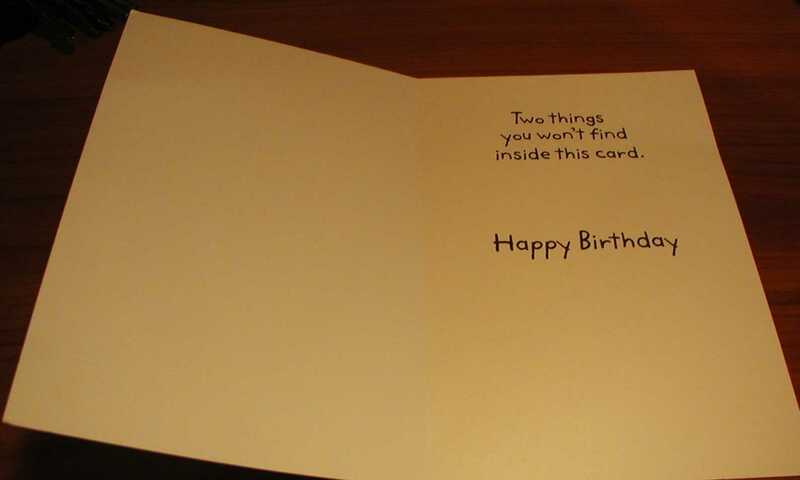 Two things you won’t find inside this birthday card. 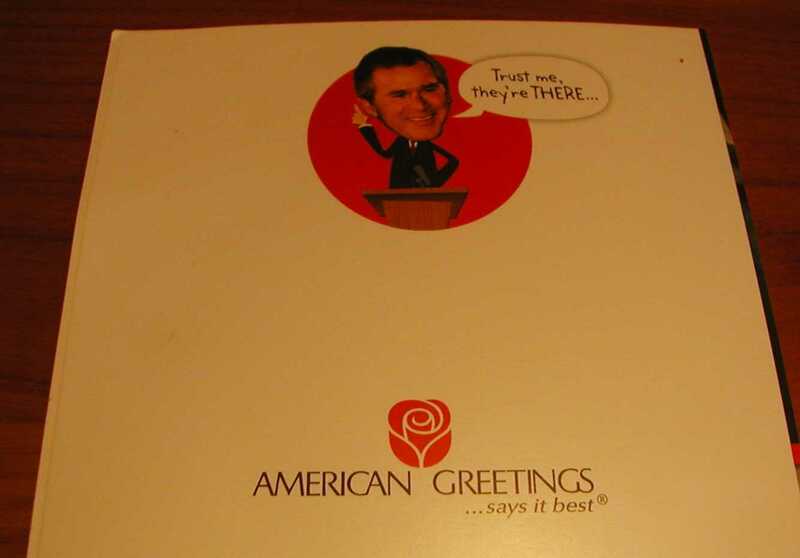 So what’s your point, “American” Greetings? I suppose they’re trying to cater to a hip urban crowd who’s swallowed the load that Iraq didn’t have weapons of mass destruction because those that have been found were just about destruction, not about destroying Catholic worship cermonies. I’ve never paid much attention to greeting card manufacturers, but I know that the maker’s name is listed right above the price, and I’ll buy my 149 cards from Hallmark now, thanks.